Ohio State, Oregon: Good ratings for college football playoff call credibility of Bush administration’s Ari Fleischer into question. 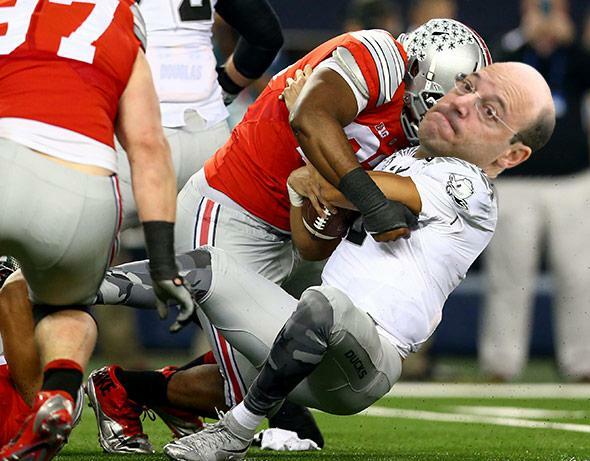 Bush administration press secretary Ari Fleischer gets tackled. Photo illustration by Slate. Photos by Ronald Martinez/Getty Images and Spencer Platt/Getty Images. “A playoff scheme would be contentious and would create a whole new level of frustration between fans and teams,” Fleischer explained. “It’s like saying we should get rid of the Macy’s Thanksgiving Day Parade and hold smaller parades all across America,” Fleischer said. After years of agitation and fan demand, college football authorities finally gave into the pressure and switched this year to a playoff system. The result? College football’s inaugural playoff championship game on Monday night is now in the books as the high-ratest cable television program of all time, drawing a staggering 18.5 overnight rating, according to Nielsen. Is it possible that Ari Fleischer was totally wrong about a position he advocated in public with total certainty? *Correction, Jan. 13, 2015: This post originally misstated Bowl Championship Series as Bowl Championship System.